The lawn moth favours newly laid lawns that are being watered daily and well maintained lawns as these provide the ideal conditions for hatching eggs. It is important with a newly laid lawn to make sure it does not get infested with lawn grub, especially within the first 2 - 3 weeks, as a bad infestation in a new lawn can be very damaging. You can buy a chemical treatment with a recognized lawn grub kill, which will eradicate the problem. We recommend that if your lawn ever becomes heavily infested with lawn grubs, the lawn is sprayed immediately and then sprayed again one week later. By doing this you would break the lawn grub cycle in your lawn. 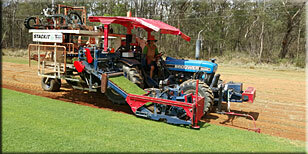 Afterwards, apply a fertilizer high in nitrogen to stimulate leaf growth. In the photo gallery you can see two images, the First shows signs of Lawn Grub Damage. The customer complained about Bald patches in their Buffalo lawn. 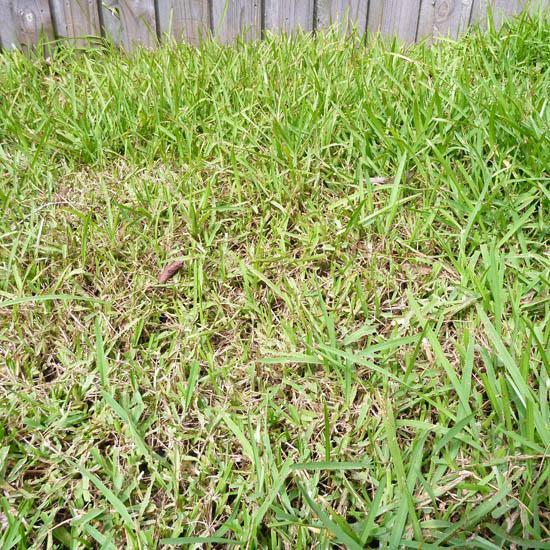 These patches are signs of Lawn Grub Damage. The second photo shows upon closer inspection that the leaves have been chewed and there are clear indications of Lawn Grub poo.